I thought I'd take the time to write this guide, I've seen people ask about how to overclock a GPU several times as the process is simple enough to explain in a guide. This is a guide for beginners explaining the basic software overclocking. I will perhaps add a BIOS flashing guide and maybe some voltmods later on. This is very easy to determine, simply download and run a very simple application called GPU-Z. The brand of your graphics card will determine what software you will use to overclock it. You will easily be able to see whether you have an ATi or Nvidia GPU. 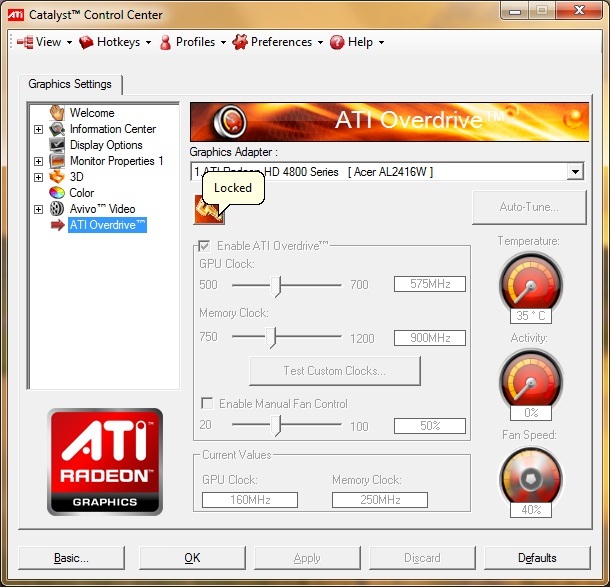 A. Overclocking an ATi graphics card. Software required: ATi Catalyst Control Centre which should be already installed on your PC if you are running updated drivers. Otherwise, it can be downloaded from ATi's website. Yes, there are overclocking limits in CCC, but if you are a beginner, (which you are if you are reading this guide) you do not need to go above these limits, don't get ahead of yourself as graphics card can be very delicate. 1. First off, you will need to enable Overdrive, click on ATi Overdrive in the left menu. 2. You will see a screen with your overclocking slides greyed out. Click on the key to recieve a lecture from ATi about the dangers of OC'ing blah blah blah and enable overdrive. 3. Your overclocking tool is at your disposal! Please use the method explained in section 4 to overclock your graphics card safely. And leave the fan at auto, the card will not get hot enough without voltage tweaks for you to have to manually adjust the speed. Have fun! Software required: Rivatuner. Whilst Rivatuner is a third party piece of kit, I would recommend it over Nvidia's own tool. It is easy and simple to use. 2. Check the "Enable low level hardware overclocking" box, this will allow you to overclock without going through the drivers. It will prompt you to reboot in order to detect default clock speeds. If you have never attempted to overclock, you can click "Detect now" otherwise a reboot is required. Once this is complete, overclocking options will be at your disposal. See the third section of this guide for help on using these. Once again, I recommend leaving the fan on auto, your card will not overheat without increasing the core voltage which you are not doing. And I also recommend linking the core and shader clocks, this simplifies things for beginners and eliminates variables. Software required: Furmark, which is a free benchmarking and stress testing tool which we will be using to test for stability. It doesn't matter which brand you have, the technique stays the same, overclock one clock at a time, this eliminates variables and allows you to pinpoint at what clock speed the core/memory becomes unstable. Do not try and overclock the core and the memory all at once, as it is impossible to determine at what frequencies they become unstable. 1. I recommend starting by the core as this often has the biggest impact on performance. For example, if your starting core clock is 600MHz, raise it to 610MHz (Instructions on how to do this will be explained later in the guide. ), run a 60 sec. Furmark stress test, if it passes with zero artifacts, increase the frequency another 10MHz and repeat the process. 3. When you stability test either crashes or displays artifacts, it means that you have reached the frequency limit of your core/memory with the tools currently at your disposal. Back down 10MHz to ensure 100% stability. 4. Once you have completed the process of overclocking the GPU core, we can move onto the memory. Repeat the exact same steps explained in the core clock overclocking. 5. Finally, we can test for complete stability of the graphics card with both the core and memory overclocks. This will of course be longer than a 60 second test. If you don't feel like watching Furmark for an hour, feel free to start up your favourite graphic intensive game, maybe Crysis, FEAR etc, just make sure it's not Asteroids as it need to actually stress the GPU. An hour of perfect gameplay is enough to ensure that your card is stably and successfully overclocked! And yes, I know there are already GPU overclocking guides, but they are outdated and not very good anyway. Maybe we could use a separate overclocking section on the forums? worshipme, do you adjust your bios at all...? do you keep your PCI-E frequency on auto or do you raise it manually...? The PCI-E buses are really only designed to run at what they come with at "auto". 2500MHz for 1.1 and 5000MHz for 2.0 I believe :S. Increasing them runs the risk of damaging your northbridge and give you VERY little positive feedback. Lmfao; Without even putting down a word. This is why you are awesome.